The Magellan Telescope with MagAO’s Adaptive Secondary Mirror (ASM) mounted at the top looking down some 30 feet onto the 21-foot diameter primary mirror, which is encased inside the blue mirror cell. Image released Aug. 20, 2013. Astronomers have taken the sharpest-ever photos of the night sky in visible light, with the aid of a new camera and "adaptive optics" system that cancels out the blurring effects of Earth's atmosphere. The photographic gear, which is installed on the 21-foot (6.5 meters) Magellan telescope in Chile's Atacama Desert, captures visible-light images twice as sharp as those snapped by NASA's Hubble Space Telescope, researchers said. The power of visible light adaptive optics: On the left is a “normal” photo of the theta 1 Ori C binary star in red light. The middle image shows the same object, but with MagAO’s adaptive optics system turned on. Eliminating the atmospheric blurring, the resulting photo becomes about 17 times sharper, turning a blob into a crisp image of a binary star pair. These are the highest resolution photos taken by a telescope. Image released Aug. 20, 2013. Hubble had long taken the best visible-light photos, the limitations imposed by its relatively small 8-foot (2.4 m) mirror more than offset by the advantage of being above Earth's atmosphere. But the adaptive optics system developed by Close and his colleagues helped dethrone the venerable space telescope. 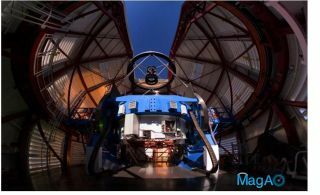 The team's "Magellan Adaptive Optics" system, or MagAO for short, uses a magnetic field to float a razor-thin, 2.8-foot-wide (0.9 m) mirror 30 feet (9 m) above the Magellan telescope's main mirror. This small, curved mirror can change its shape at 585 points on its surface 1,000 times every second, researchers said. Close and his colleagues report the first science discoveries from the new camera and MagAO in three papers published today (Aug. 21) in The Astrophysical Journal. A Magellan Adaptive Optics image of Orion 218-354 silhouette after removal of light from the central star. The image on the left shows the dark silhouette of the disk against the bright background light of the Orion nebula. The image on the right shows how the new capabilities allowed astronomers to probe of nebular light passing through the disk, telling them about the distribution of gas and dust. Image released Aug. 20, 2013. In one study, the team pointed the Magellan telescope at a famous binary star in the Orion nebula called Theta 1 Ori C. The astronomers took a photo resolving the binary into its two constituent components — something that had never been done before. "I have been imaging Theta 1 Ori C for more than 20 years and never could directly see that it was in fact two stars," Close said. "But as soon as we turned on the MagAO system, it was beautifully split into two stars." Another study looked at how radiation from Theta 1 Ori C affects planet-forming disks around nearby stars, while the third investigated the distribution of gas and dust around another star in the Orion nebula. "It is important to understand how dust is laid out in these objects because that dust and gas is what nature uses to build planets," Close said. "Our new imaging capabilities revealed there is very little dust and gas in the outer part of the disk." "This tells us something about planet-forming disks in these dense, stellar nurseries," he added. "There appears to be a limit to the formation of massive planets very far away from their parent stars. One possible explanation might be the presence of a massive star like Theta 1 Ori C stripping away the outer gas and dust."